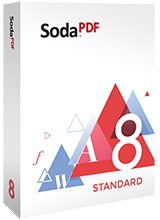 The award-winning Soda PDF is a highly powerful and customizable PDF software that allows you to pick and choose the specific functions that best suit your needs. Its modular design and user-friendly interface make it simple and easy to use, while offering all the features and functionality you expect from a complete PDF solution. Soda PDF Standard allows you to read PDFs and digital books in 3D, create PDFs from 300+ file formats, convert PDFs to MS Office files, and edit your documents. The more advanced Soda PDF Pro also allows you to create fillable forms, collaborate on and review your documents, and protect important data with 256-bit encryption level passwords. With Soda PDF, you will have all the tools you need to get the job done.